(Above) Sron a Ghoire et al this morning. Intermittent hazy sunshine today though it was cool in the strong wind at altitude. Good snow cover persisting for the time being though milder conditions in prospect. Most recent build up lies on South to South West aspects. (Above) A quite snowy Coire Dubh just above the A86 trunk road. 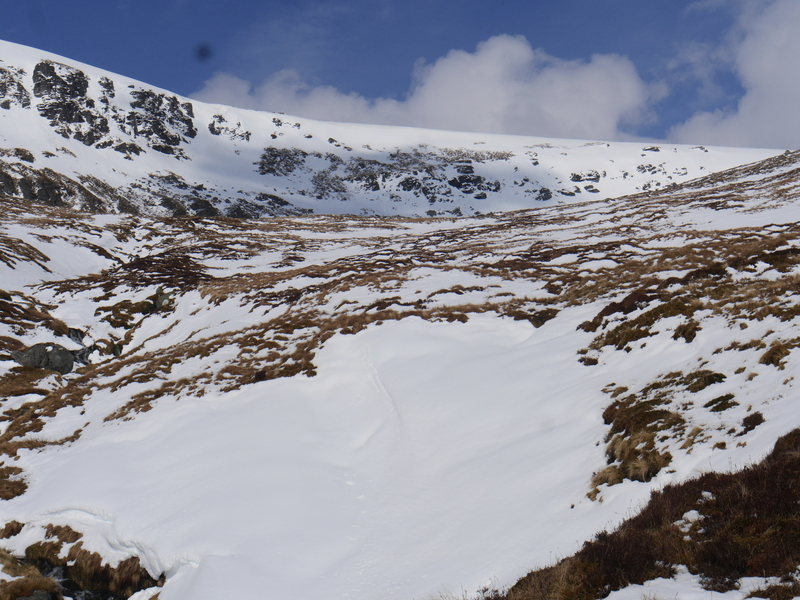 (Above) The glen/coire immediately east of An Cearcallach, the subject of today’s perambulation. Some new snow had drifted in overnight but this was bonding up quickly in the cool spring air and warmish sunshine. (Above) A photo taken across upper Glean Spean towards Aonach Beag (1116m) to the left and just out of shot, and Beinn Eibhinn on the right. Annoying haze smudges some of the detail, unfortunately.